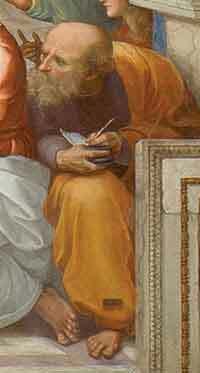 Anaximander (c. 610–546 BC) taught that humans evolved from fish. Such evolutionary ideas were common in ancient pagan societies such as in Greece and Rome. While studying ancient history at University, I came across the pagan beliefs about origins. It was this study that caused me first to question evolution and the vast ages given for the Universe. It was later, after many years of scientific investigation, that I finally broke free from a liberal understanding that sought to harmonise naturalism with biblical Christian faith. Concerning the great ages of the Universe, Plato and many Greek philosophers held to the view that this present Universe came about millions of years ago. 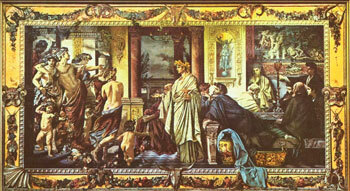 Plato's symposium. Plato promoted a great age for the universe (deep time). 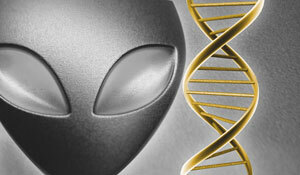 Francis Crick, co-discoverer of DNA’s structure, proposed that aliens brought life to earth, a modern pagan idea. More recently, scientists have been thinking up ‘new’ theories to explain how life could have developed on Earth, given the vanishingly small probability of spontaneous evolution actually happening. The late Francis Crick, the co-discoverer of DNA’s structure (along with James Watson and Maurice Wilkins), came to believe that aliens, and not God, were responsible for life on earth.14 The pagan gods have struck back with a vengeance! Solomon wrote about 3,000 years ago: ‘There is nothing new under the sun. Is there anything of which it may be said, “See, this is new”? It has already been in ancient times before us. There is no remembrance of former things, nor will there be any remembrance of things that are to come by those who will come after’ (Ecclesiastes 1:9-11). Barnes, J., Early Greek Philosophy, Penguin Books, London, England, p. 72, 1987. Return to text. Cartledge, P., Democritus, Phoenix, London, England, pp. 20–21, 1998. Return to text. The Epicurus Reader: Selected Writings and Testimonia, translated and edited by Brad Inwood and L.P. Gerson, introduction by D.S. Hutchinson, Hackett Publishing Company, 1994. Return to text. Pliny the Elder, Natural history, translated with an introduction and notes by John F. Healy, Penguin Books, London, England, p. 13, 1991. Return to text. Lactantius, The Divine Institutes 7:14, Of the first and last times of the world, <www.ccel.org/ccel/schaff/anf07.iii.ii.vii.xiv.html>. Return to text. From The Mundaka Upanishad, Understanding Hinduism, pp. 5–9, <www.hinduism.org.za/creation.htm>. Return to text. The Bhagavad Gita, translation and introduction by Eknath Easwaran, Penguin, Arkana, p. 142, 1985. Return to text. Augustine of Hippo, City of God 18:40, About the most mendacious vanity of the Egyptians, in which they ascribe to their science an antiquity of a hundred thousand years, AD>410, <www.ccel.org/ccel/schaff/npnf102.iv.XVIII.40.html>. Return to text. These figures are based on the Greek Septuagint translation (ca. 250 BC), while our English Bibles are mainly translated from the standard Hebrew (Masoretic) text. Dr Pete Williams shows why the Masoretic Text is likely to be closer to the original Hebrew in ‘Some remarks preliminary to a Biblical chronology’, Journal of Creation 12(1):98–106, 1998; <creation.com/chronology>. Return to text. Augustine, ref. 8, 12:10, <www.ccel.org/ccel/schaff/npnf102.iv.XII.10.html>. Return to text. Theophilus, To Autolycus 3:26, Contrast between Hebrew and Greek Writings, AD 181, <www.ccel.org/ccel/schaff/anf02.iv.ii.iii.xxvi.html>. Return to text. The Extant Fragments of the Five Books of the Chronography of Julius Africanus 3(1), On the mythical chronology of the Egyptians and Chaldeans, <www.ccel.org/ccel/schaff/anf06.v.v.i.html>. Return to text. 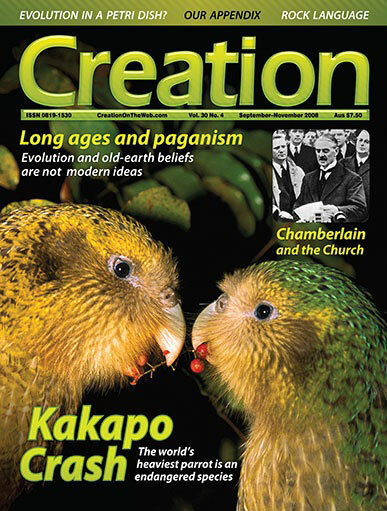 Walker, T., The way it really is: little-known facts about radiometric dating, Creation 24(4):20–23, 2002; Radiometric Dating Q&A <creation.com/dating>. Return to text. Bates, G., Designed by aliens? 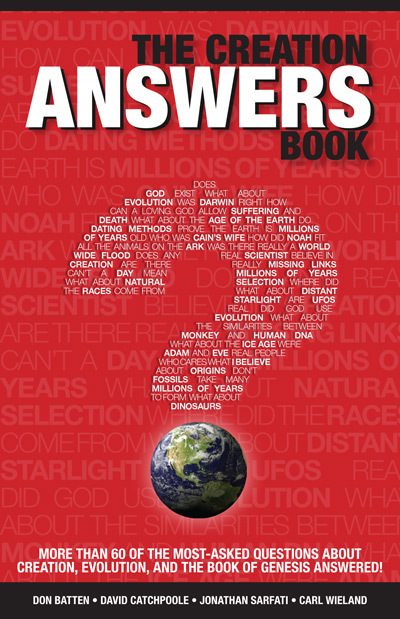 Discoverers of DNA’s structure attack Christianity, Creation 25(4):54–55, 2003; <creation.com/aliens>. Return to text. Tegmark, M., Parallel Universes, Scientific American 288(5):31–41, May 2003. Return to text. But it is unscientific and special pleading. See Sarfati, J., Multiverses: Parallel Universes, in: Refuting Compromise, pp. 187–189, Master Books, Arkansas, USA, 2004. Return to text. Augustine, ref. 8, 12:11, Of those who suppose that this world indeed is not eternal, but that either there are numberless worlds, or that one and the same world is perpetually resolved into its elements, and renewed at the conclusion of fixed cycles, <www.ccel.org/ccel/schaff/npnf102.iv.XII.11.html>. Return to text. Theophilus, ref. 11, 3:28, Leading chronological epochs, <www.ccel.org/ccel/schaff/anf02.iv.ii.iii.xxviii.html>. Return to text. An exact date for the age of the Universe cannot be ascertained, but we know from Scripture that it is somewhat less than 7,000 years—see Freeman, T.R., The Genesis 5 and 11 fluidity question, Journal of Creation 19(2):83–90, 2005; Sarfati, J., Biblical chronogenealogies, Journal of Creation 17(3):14–18,2003. Return to text.